Few days ago we posted that Parenthood's Savannah Paige Rae will play [SPOILER ALERT] the 5-year old Debra in the flashbacks of the season 7 premiere of the show. According to IMDb.com Nicolas Vigneau is the kid who plays the 7-year old Dexter on episode 7.01. 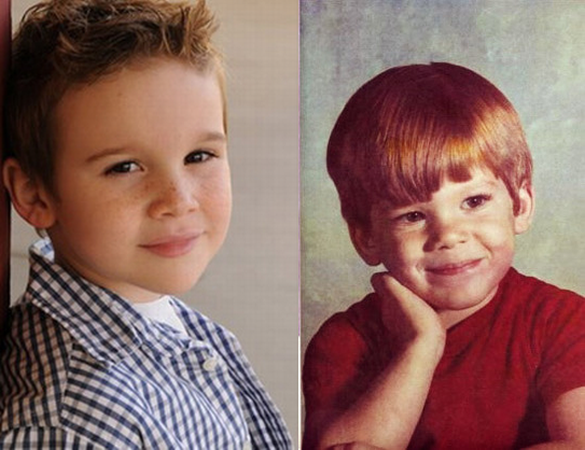 As you can see in the left photo above Nicolas looks like Michael C. Hall when he was a kid. Indeed they really look alike! Especially the nose,the eyes the mouth, the eyebrows! Great casting choose. 7-year old Dexter? Maybe Deb watches him kill his first animal. Interesting that they finally identified the age gap and stuck to it... it was always two years in the book, but in the show, sometimes they made them out to be a little further apart. *In season 1, Astor celebrates her 9th birthday, but in the season 5 flashback of Dexter's and Rita's first date (6 month before season 1) Rita tells Dexter that Asotr is 9. *In season 2 (2007) Deb tells Lundy that if he was 10 years younger she would be in high school. But Dex graduated in '91, so Deb had to be at least 6 years younger than Dex. *In season 3 Dexter finds out that Rita has been married before Paul. According to the marriage certificate, she was born in '87 and got married in 1990. *Astor is 10 in season 3, but 12 in season 5, without having a birthday party in season 4 or 5. *There is now DOB given on Lumen's driver's licence. At least they stopped with the actors with multiple moles in different spots that made it look weird each time. I'll have no problem believing both actors as the younger counterparts to Dexter and Debra, which is a relief. As far as plot is conceded, I would enjoy it if Debra found Dexter burying a dog in the garden. Young Dexter could convince young Debra not to tell their parents about what he had done. A scene like that could tie into the present very well, I think. Maybe (I mean, what else should it be?). According to Dexter's drivers license he is 41 like Michael. If Debra is two years younger that would make her 39. Hmm. Bless that boy's cotton socks.